Email Collectors in Recapture are easy to setup and allow you to use a number of pre-configured templates. 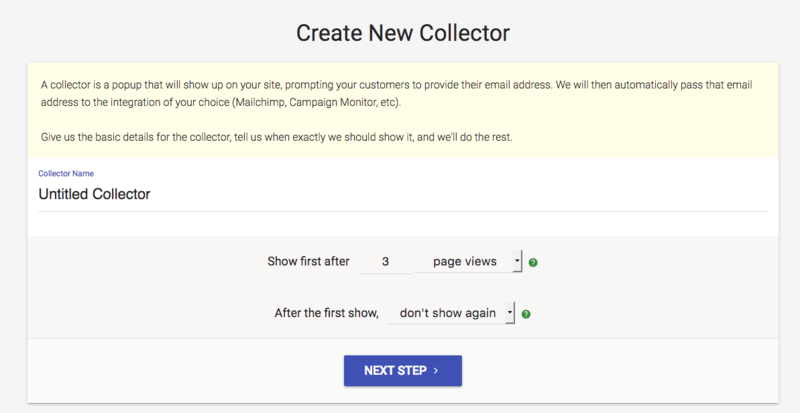 You can setup the call-to-action (CTA), the text, the background color, button color and more. 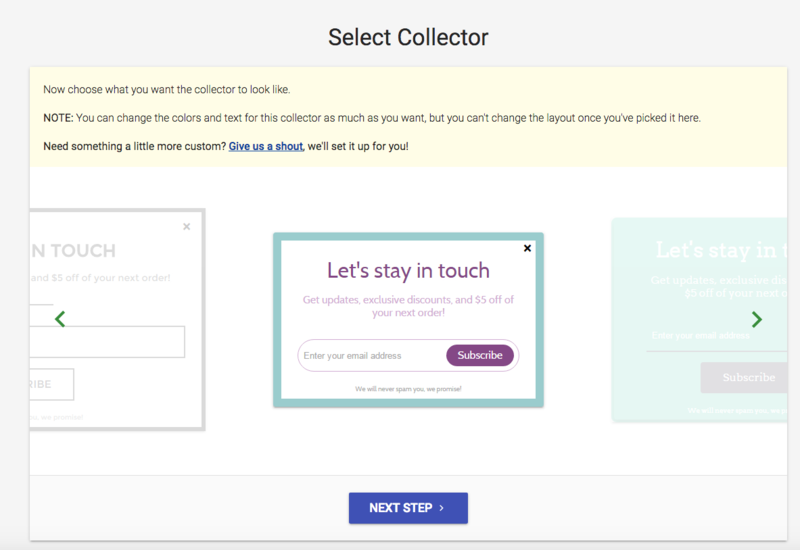 What can Email Collectors do? 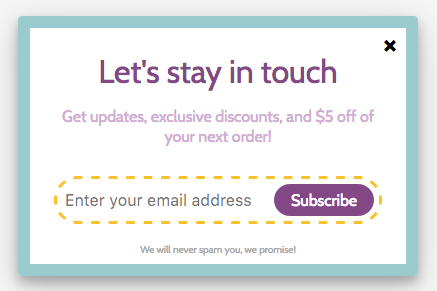 When can I trigger an Email Popup? How can I configure Email Collectors? You can configure one active email collector (but you can create as many as you like, and enable one at a time. This is good if you have special promotions, holiday discounts, etc and allows you to swap them out easily) You can enable the collector by clicking the switch on the far left from Off to On. 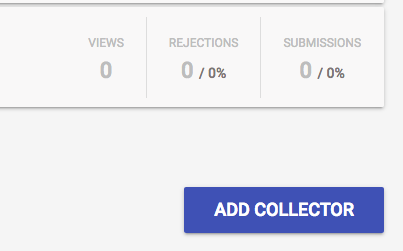 Now, give your collector a name and decide when you want to make it appear. Click Next Step when you're done. Pro Tip: If you want emails for "Add to Cart" events, use "Show after 1 Products in Cart"
Next, pick the template you want to use for displaying. Use the arrows on the left and right to scroll through the designs. 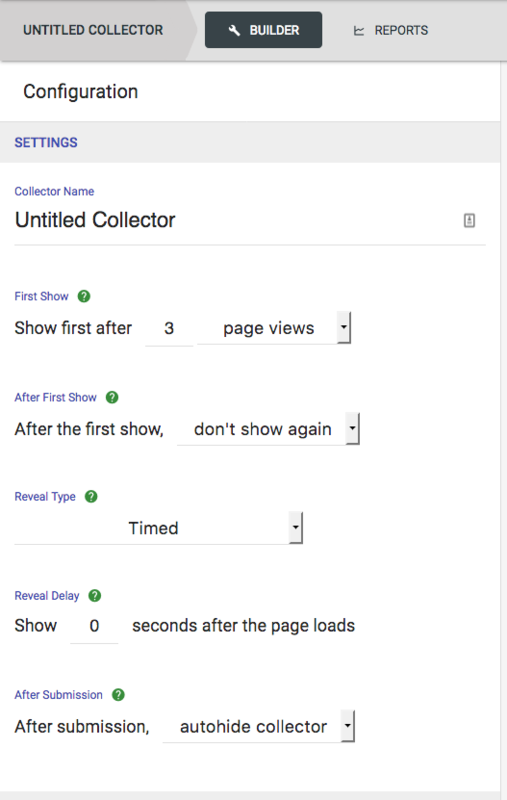 First Show will determine the initial event used to pop up the collector. Again--it can be timed or triggered, based on the selection you make. After First Show allows you to decide if this popup should reappear later (if they dismiss it). It won't reappear if they enter an email address, ever. Reveal Delay is a timer that allows you to further tune when the email popup will appear. This delay will start AFTER the trigger event from First Show is activated. 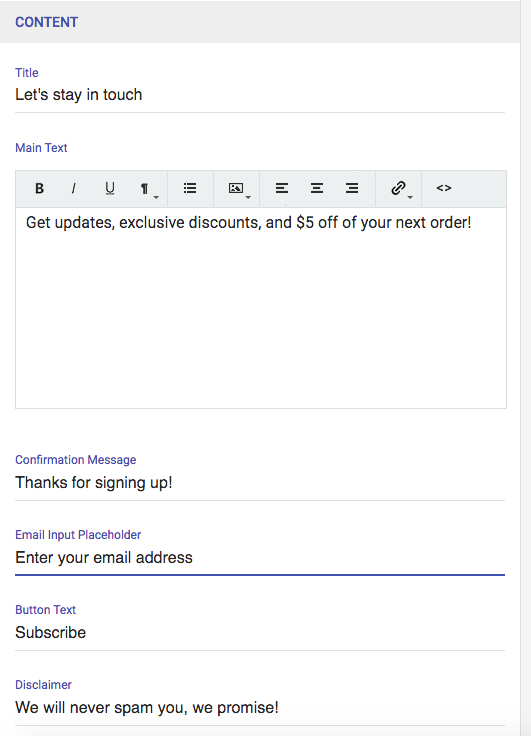 Example: If you have First Show set to After 3 Product Views and Reveal Delay set to 5 seconds, then once the user browses through 3 products AND 10 seconds have passed AFTER the 3rd product view, the email popup will appear. We won't cover those in much detail because when you change the values here, the popup preview on the right will change (LIVE) and you'll see the result. It's pretty intuitive to use. Below the colors, you can change the text for each item in the popup.